Hou Canoes ethos is simple; ‘Ethical, Responsible and British’. As a family business we navigate life using our moral compass, in a nut shell we always try to ‘do the right thing’. Whether that’s buying power from a green supplier to our ongoing relationships with charities, we always strive to treat others as we would like to be treated ourselves. We continually try to be fair with customers, employees and suppliers alike, always being accountable for our actions. We are mindful of our social agenda with ongoing projects such as working with the Canal and Rivers Trust, Bliss Canoe Trail, Glenmore Lodge and British Canoeing to name but a few, endlessly looking to improve accessibility for all. We are always conscious of environmental issues and how best to minimize our planetary impact. Hou canoes will always focus on sustainability and legacy whilst being ‘Ethical Responsible and British’. 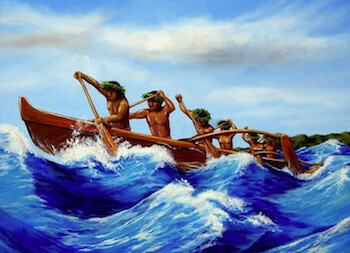 About 4,000 years ago, the Austronesian peoples from South East Asia started exploring the ocean in canoes. As they developed these craft it allowed them to explore further into the Pacific Ocean. The craft were phenomenal boats and over time they developed into huge sailing canoes that allowed the people to populate just about all of the Pacific Islands. These hollowed out logs or the 'canoe' as it is now known enabled them to move on from squabbles over land and find new lives for themselves. The canoes had to look after the paddlers in calm and turbulent waters and also allowed them to catch bigger fish than they could from the land. The humble canoe was the ‘motor car’ of its day, allowing them to hunt, explore and travel. The builders of these craft were proud of their canoes; a man’s canoe was part of his family. As often is the case there is no direct translation but 'hōu' is a Polynesian word meaning new. New as in a fresh, type of new. So…..New Canoe. Despite being involved in the paddlesports industry for many years, we established hōu Canoes in 2013 making us the new kid on the block in canoe manufacturing. And like the Austronesian's before us, we are proud of our canoes, we give them names and they are part of our family. We want you to travel well with your hōu Canoe, our boats are designed to look after you on flat or moving waters, for it to take you to new places, to catch bigger fish, and to help you explore life’s rich and enjoyable journey.